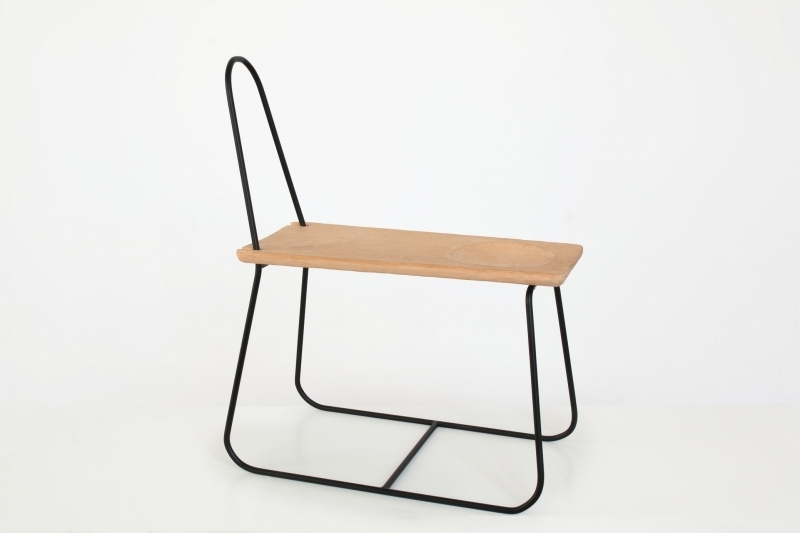 Pani Jurek`s project refers to the furniture collection which includes the old stools, chairs and armchairs. For Peter Szacki an extremely important was the aspect of manual work and the relation that exists between man and object. Today, a lot of housework is done standing and in a hurry. I wanted to create a piece of furniture that will allow to perform comfortably kitchen duties, celebrate them and enjoy them. Simple, steel frame provides a neutral basis for the lengthened seat. Features and appearance of the board which is the seat can be adjusted to individual needs. The scope of the work is very broad, ranging from kitchen activities, workshop, ending on the fun. The prototype is made from the old board, carved with chisel and was created for kitchen work, such as cracking nuts, shelling beans or peeling potatoes. Zydel – the collection of PME, the Basic Economy and Craft Storehouse. In terms of design “zydels” refer to the richly carved Renaissance chairs called "sgabello", occurring in European furniture making. In terms of design “zydels” refer to the richly carved Renaissance chairs called "sgabello", occurring in European furniture making. “Zydel” is structurally the simplest form; consisting of the board seat with attached four rod-shaped legs and the backboard – the backrest made of a single board. The board seat, mostly in a trapezoidal shape (sometimes with beveled corners). The chairs with backrests spread in villages at the beginning of the twentieth century, previously were used by the wealthiest farmers. Initially, this type of chair belonged to luxury equipment, treated as the seat of honor. Because of not complicated structure zydels could be created on farms (by using an ax, spokeshave, chisel and saw). Their basic decoration is an ornamental form of backrest (with using openwork, molding, woodcarving decoration, polychromy), but some of them don`t have an ornamentation. This form of chairs was an inspiration for postwar designers who have been creating furniture for Cepelia, hence its popularity up to now (eg. zydels were placed together with the former office furniture equipment in PME).